Jeff and I have spent the last three weeks debating exactly when we were going to tell people this news. After all, it's early in the game right now. Way early. But when everybody and their brother knows you're going through fertility treatment (and I had to tell people because I don't suffer in silence), you lose the privilege of keeping the news to yourself the first fourteen weeks, which would have been ideal. So I tell you now if you don't already know, which is highly unlikely, that I am six weeks and four days pregnant with what appears on an ultrasound to be a bean, or a grain of rice, or some other side dish with a tiny heartbeat. It's going well. I am completely freaked out by the idea of people knowing this so soon, and I really, really hope I don't have to write any bad news here in the next seven and a half months. I know there's a small army of people out there hoping the same thing on my behalf. You know that thing I wrote in the last post about eating well in support of Jeff? Well, that's all over now. Jeff is still impressing the hell out of me with his ability to stay on a diet, and I am eating whatever happens to sound good at the moment, which can be pretty random. I'm not eating any worse, but fat free cottage cheese and salads are sorta out the window. Red meat isn't doing anything for me either. Cream of wheat, on the other hand, has rocked my world. I feel pretty good, which constantly worries me. And the times I don't feel so good? Also worries me. People tell me the first trimester is fraught with anxiety, and I want to say "No kidding?" Jeff and I were so worried about ever getting pregnant it never occurred to us how freaked out we'd be about staying pregnant once it actually happened. Danielle gave me a pregnancy book as a gift, then took it back to white out some of the scary parts. "Because," she said, "I know you have a tendency to dwell on the worst thing that could happen." So that's the news for now. Next ultrasound is a week from today. In the meantime, I am being extra nice to the cats, because they're the real victims in all this. They have nooo idea what's coming. A week ago Jeff went on a diet. A real one, not just a "I'm gonna try to eat better" diet. (Believe me, we've been on plenty of those and they don't work...) He's been very disciplined about it, as he often is about things when he really commits. He doesn't even complain. He just eats his salad and takes it. Since I am still on the getting knocked up program, however, I am not on a diet. But I promised him I would not cheat on him with food. So I don't eat junk anymore, even when I'm not physically in his presence, such as when I'm at work and a patient brings a Toblerone gift basket to the nurse's station. Declining chocolate with the excuse of "I'm sorry, I can't, my husband's on a diet," might sound a little strange, but, actually, most people understand the reasoning behind it. I 've even gotten a few sage, "Say no more, I've been there" nods. So expect to see a thinner Jeff soon, and a Jayne who, at the very least, is no fatter. Of course, this really cuts into our social life, which up until this point consisted mostly of long, magnificent dinners with Max, Danielle and Joel that ended with key lime pie. (Mmmm, key lime pie.....) There hopefully will be a lot more coffee and cards in our future. Maria and I have worked together for about four years, and like me, she's been a nursing assistant, worked at the desk, etc. In fact, her mom Cristina still works on our floor as a nursing assistant, which means Maria will shortly be the boss of her mom, as much as anyone can really be the boss of Cristina. When I came in to work on Thursday night, the day shift charge nurse, Mindy, stopped me at the nurse's station. "I get to go home?" I asked naively. "Noooo," she said, and I suddenly notice everyone around the nurse's station watching and giggling expectantly, "you're the charge nurse tonight." "Me???" I said, panicking, "Don't you need training to do that??" She explained that the night charge nurse had called in sick and that, technically, I'd been there the longest of anyone else who was on. Never mind that the vast majority of that time was spent not as a nurse. I tried to explain to Mindy that this was only slightly better than making a janitor charge nurse, but there was no arguing. She assured me I would be fine, made a list of stuff I needed to get done, and checked all the crash carts with me. Then she went home and it was just me, sitting at that desk, feeling tiny. I called Jeff and told him the situation, and he immediately said, "Don't you need some kind of training for that?" After I got off the phone with Jeff, I sat back down at the desk, trying to look official. 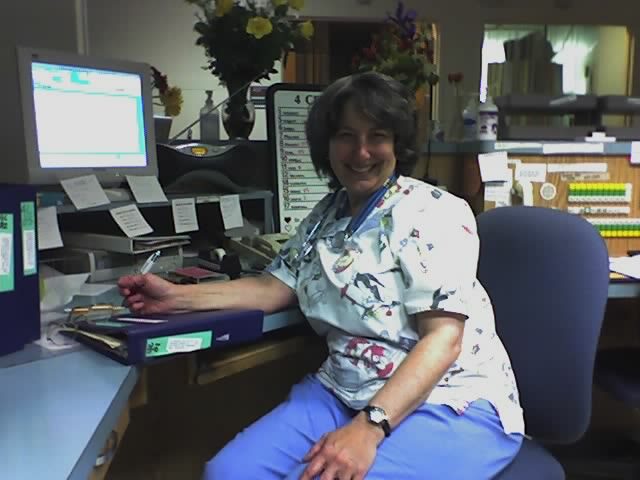 "Hey, Maria," I said to the secretary who was sitting next to me at the desk,"what do you usually see the charge nurse doing this time of night?" "Ummm, getting report on all the patients from the telemetry tech?" "Oh, " I said, "that's a great idea!"